Jane Austen‘s life spanned two revolutions (the American and French) as well as Napoleon’s rise to power. In the romance trade, this era was known as the Regency period. It was a time of upheaval and uncertainty for the British Empire but when you read Austen’s work, it’s as though she was ignorant of the world beyond her tight little circle. In her novels, she created small, intimate communities where she simultaneously satirized and embraced the hypocrisy of her time, namely the audacity of an entitled, landed gentry who sneered at the merchant class, never bothering to ask or understand where the money came from to pay for their extravagant lifestyles. In that narrowly prescribed sphere, Austen’s driving theme focused exclusively on the trials and tribulations of young women in their quest to secure a suitable mate. For that was the sole measure of success for any young woman – the quality of the husband she caught. Of all the Austen heroines, who snagged the best man? Elizabeth Bennet in Pride and Prejudice. According to the values of the Regency period, the more aristocratic, the more haughty and arrogant, the more desirable the man. Without a doubt, Darcy was the crème de la crème. He was the wealthiest of the bunch. Both his parents were dead and therefore couldn’t harass Elizabeth after the marriage, as you just knew Edward’s mother would do to Elinor in the post-wedding world of Sense and Sensibility. Emma spent more time with Frank Churchill who turned out to be a foil hero with the real husband material, Knightley, relegated to the background for much of the story. Edmund in Mansfield Park was a sap, easily entrapped by the villainess, Mary Crawford. Captain Wentworth in Persuasion showed his disloyalty towards Anne when he had a fling with Louisa. Darcy’s character was crafted with the same technique used for Elizabeth – all his supposed flaws were transformed to virtues by end of the novel. His awkward arrogance was a masque for intelligence and depth of character. Colin Firth perfected the look of cool reserve hiding a deep, painfully felt passion beneath. No wonder he was Darcy in Pride and Prejudice and the modern day Prince Charming in Bridget Jones Diary. 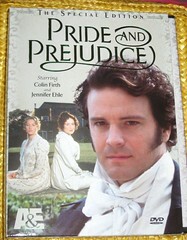 The other required male archetype of romance novels, the father, was best in Pride and Prejudice, too. Mr. Bennet may have been a weakling, but at least he wasn’t senile like Emma’s father, or died leaving his wife and daughters nearly destitute as in Sense and Sensibility. It’s a toss-up for the bottom spot, whether it goes to the pretentious, ignorant snob Sir Elliot of Persuasion or the drunken derelict of Mansfield Park who was rarely seen. Another element that sets Elizabeth Bennet apart from her peers was the interplay with Darcy. There’s the famous scene when he first proposes marriage to Elizabeth on the grounds that he’s lowered himself to accept her as the object of his desire. Naturally, she spurns him, pointing out the insult in his proposal. However, there was an earlier tête à tête where the relationship actually began. In front of Darcy’s friend, Bingley, they each offered a psychological assessment of Bingley’s personality. The exchange became a sport with the words flying over Bingley’s head, and took on the intimate tone of intellectual sparring. Their discourse generated sexual tension without the heroine losing her reputation, unlike Marianne Dashwood in Sense and Sensibility. It made Elizabeth appear smart, lively and independent compared to the others. Emma comes off as conceited and snobbish. Elinor Dashwood was staid and practical, the polar opposite of her sister, the overly emotional and melodramatic Marianne. Anne Elliot was the repressed old maid and Fanny Price was mostly an empty vessel. There was lightness to Elizabeth’s character. She foresaw her sister’s disgrace, and by association, the whole family’s loss of social standing. Nevertheless, Elizabeth’s attitude didn’t carry the weight of the indiscretion. She was resigned to not finding a husband, but not defeated by it, avoiding the more morose perspective that overshadows Sense and Sensibility. Elizabeth Bennet managed to rise above the fray at every turn, and by hooking up with Darcy, she redeemed the family’s reputation and fortune.